« What’s the Temperature Today? 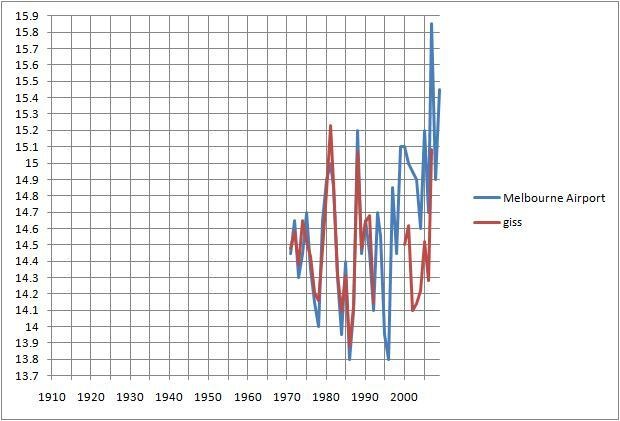 BOM vs GISS- Who’s Right? 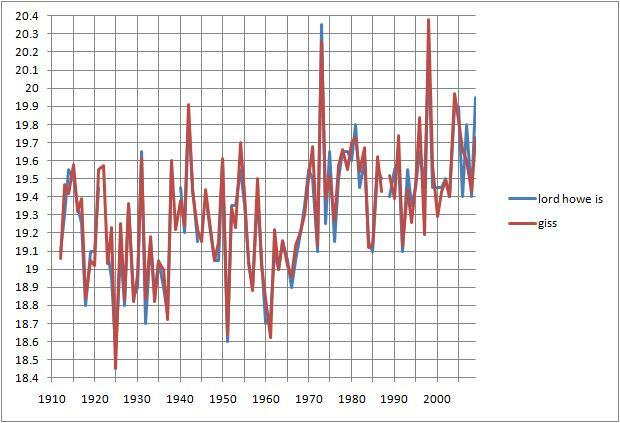 The Goddard Institute of Space Studies (GISS) produce global temperature records with raw data sourced from raw GHCN data with USHCN corrections, which in turn comes from meteorological agencies all over the world. In Australia, the Bureau of Meteorology (BOM) supplies the data from selected sites. As it is important that the data is as accurate as possible, good quality sites are preferred. In Australia, there are two sets of preferred sites for climate analysis: the High Quality (HQ) series and the Reference Climate Station (RCS) sites. These two sets overlap – there are many sites in both. 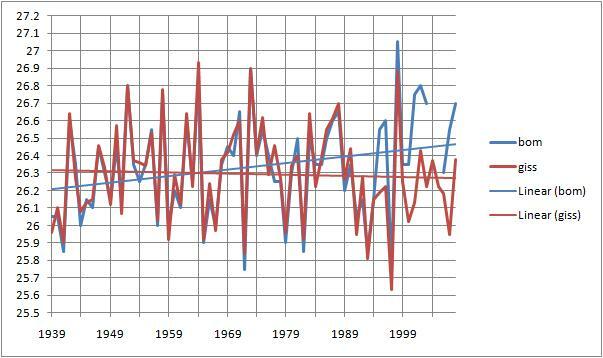 The HQ sites are used to produce BOM’s trend maps and time series graphs, and the CSIRO uses RCS data to produce the State of the Climate reports. The primary purpose of RCS is to provide a set of timeseries from which data can be interpolated/ extrapolated to check and/or fill in missing data when gridding. Therefore data from these sites are critical. Chris Gillham has analysed the records from the HQ sites which are still being used by GISS in 2010. A large number of sites, mainly rural, were dropped after 1992. Most of these have very long temperature records. It seems that all of the sites he has looked at except Launceston Airport, Perth Airport and Brisbane Airport are RCS sites. 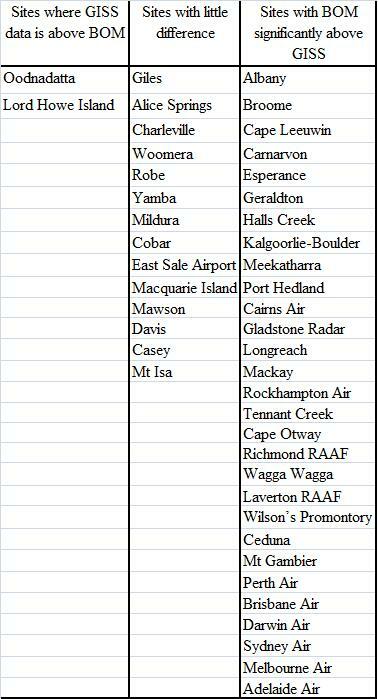 It appears that GISS get their data from a selection of RCS sites, major airports, and one other site- Eucla. In this post I will look at the remaining RCS sites. I have found exactly the same phenomenon as Chris found in his analysis. 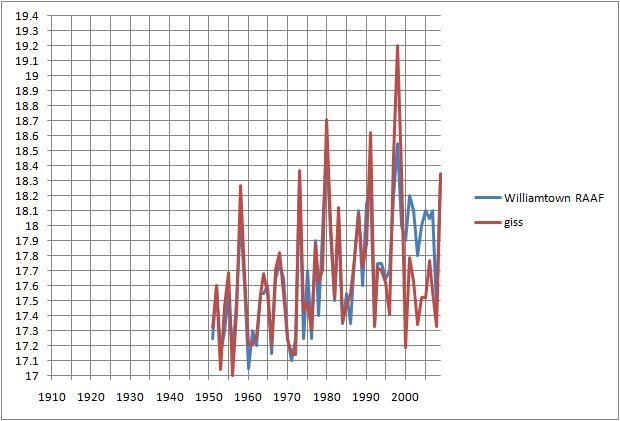 The GISS annual data matches the raw BOM data almost exactly in most years before 1995, and monthly data is exactly the same in 2010 (there are slight differences as GISS calculates annual data from December to November, not calendar years). Therefore we can say with confidence that the GHCN raw data which GISS uses is drawn from BOM raw data. 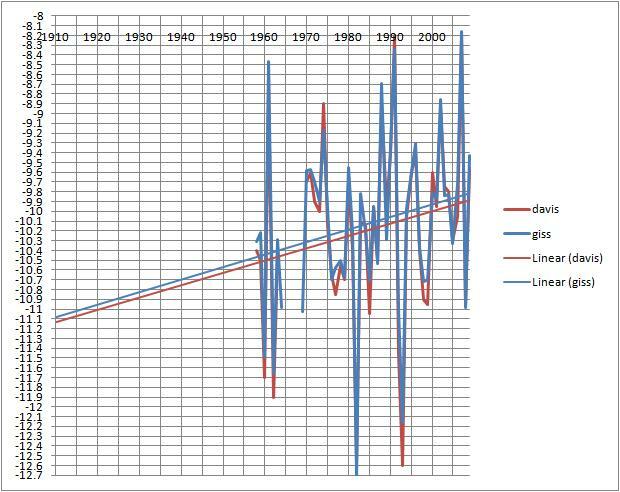 When I examined the data, I found that between 1995 and 2009 for the majority of sites the GISS raw data, which should be the same as the BOM data, is significantly less (29 sites significantly less than BOM, 2 higher and 14 similar). It is up to 1 degree Celsius lower, but typically about 0.3 to 0.6 lower. This is very odd. 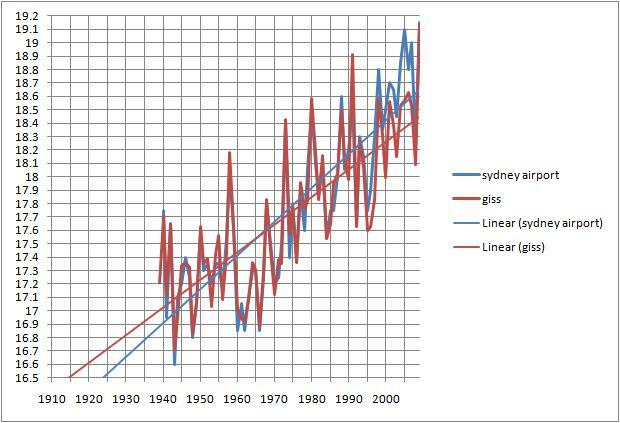 The result is that trends calculated from BOM’s raw data for the CSIRO climate analyses are much greater than those from GISS. However, for many sites, the RCS data is far too short to be of any use! It’s an embarrassment. They can’t both be right. There must be a logical explanation for this. Perhaps there has been a system wide problem with download/ upload of data, or with interpretation of site information (latitude/ longitude). 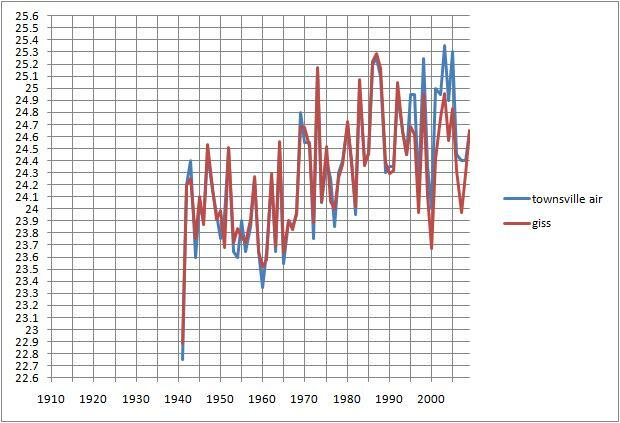 Whatever the reason, the 1990s / 2000s divergence between BOM and GISS means must be investigated and corrected. Cape Nelson Lighthouse, Nowra RAN, Winton, Maree, Forrest (92- 2000), Christmas Island, Oodnadatta, Cape Bruny Lighthouse, Tarcoola, Robe, Wilsons Promontory, Cape Otway Lighthouse, Yamba Pilot Station, Richmond RAAF, Moruya Heads Pilot Station, Richmond PO, Amberley RAAF, Cape Leeuwin, Melbourne Air (1993-99). First, the only site in all of Australia recently used by GISS that is neither HQ nor RCS: Eucla in Western Australia. It seems likely that Eucla was once considered as a possible HQ/RCS site but was subsequently not included. 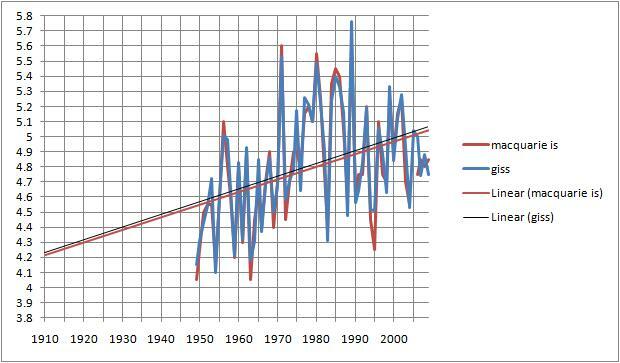 However, its feed to GISS continued from 1997, albeit with gaps in the yearly record. Note that Antarctic sites do not show this pattern – only mainland and offshore islands. 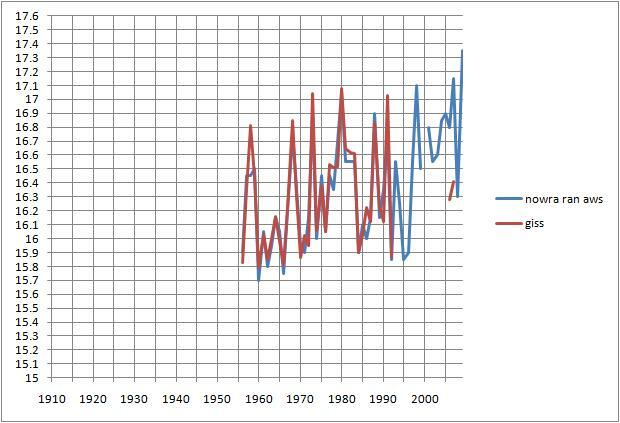 Concerning Antarctica: there are certainly few indicators of global warming (rising temperatures, mainly minima, mainly in winter and greater in polar regions) at Australia’s Antarctic bases. 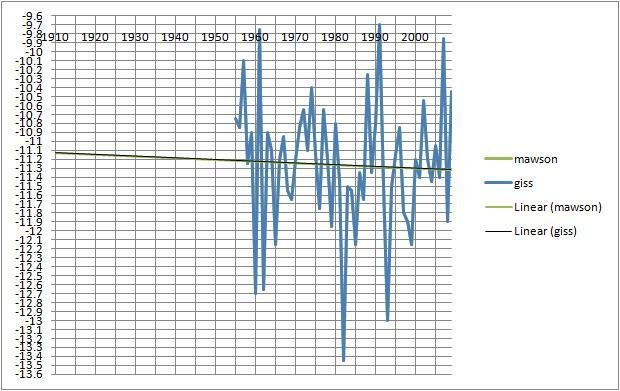 •	Rising temperatures? 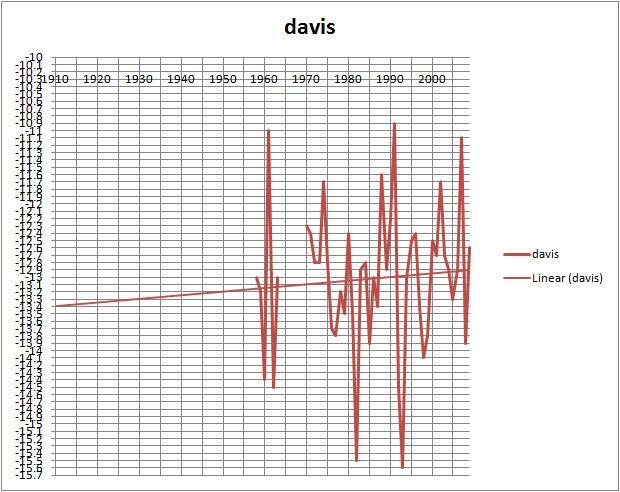 While the temperatures at Davis and Casey are rising at about 1.2C and 1.0C respectively per 100 years, this is no worse than many Australian sites; Macquarie Island’s trend is about 0.85C, peaking in the 1980s and falling since, and Mawson is cooling at -0.2C. •	Mainly minima, mainly in winter? 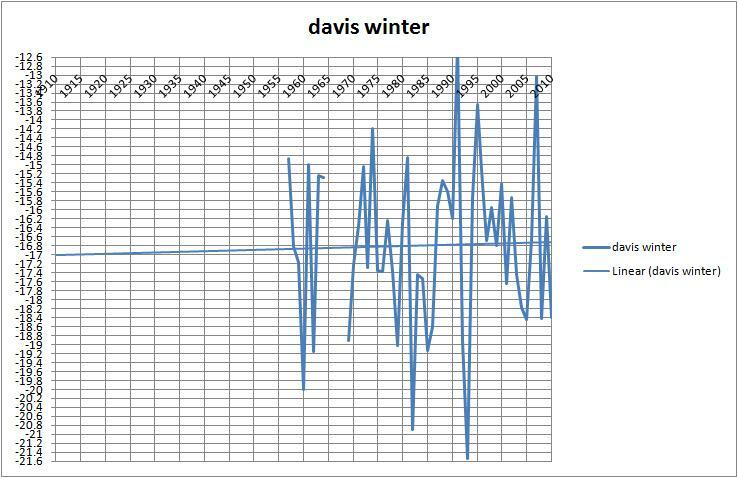 The fastest warming site, Davis, is warming less in winter (0.3C) than the rest of the year and minima trend (0.5C) is less than maxima trend. 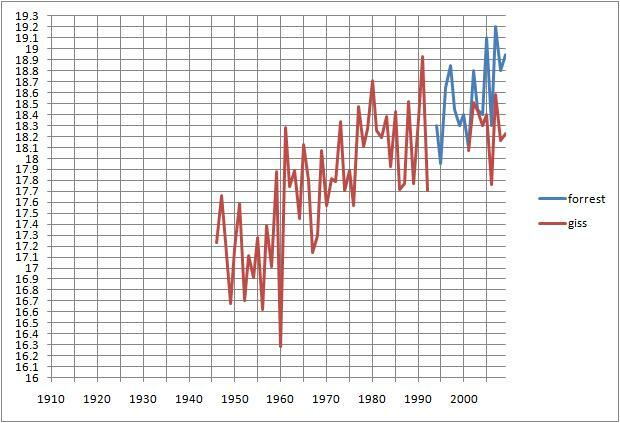 •	Greater temperature rise in polar regions? The average trend at these sites is 0.71C compared with 1 degree Celsius for the Australian mainland (according to BOM). This entry was posted on December 6, 2010 at 4:11 pm and is filed under Uncategorized. You can follow any responses to this entry through the RSS 2.0 feed. You can leave a response, or trackback from your own site. 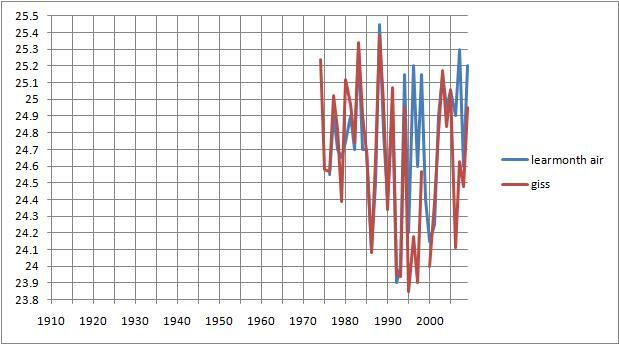 Ken, One answer to Chris Gilham’s question “What happened in 1992?” could be that in 1990, agencies agreed to procedures coordinated by the World Meteorological Organisation. This might have led to a review and tidy up. 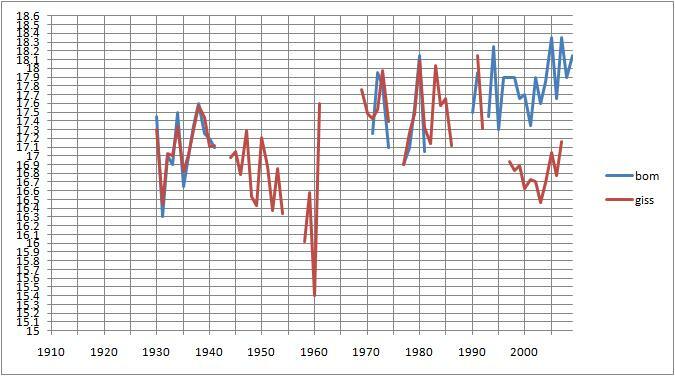 One other observation is that the differences between Tmax and Tmin at a number of Australian stations showw a closeness greater than sorrounding years 1990-2 roughly. If you are interested, I have yet another version of several of your stations above, taken from the BOM CD ending on March 2007. 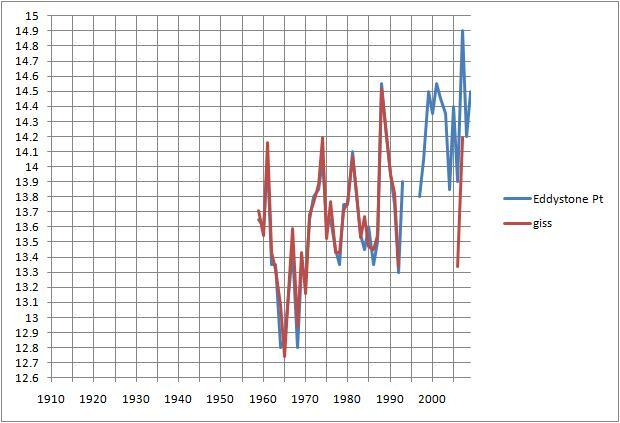 On a preliminary look, there are again differences between BOM and your GISS figures. 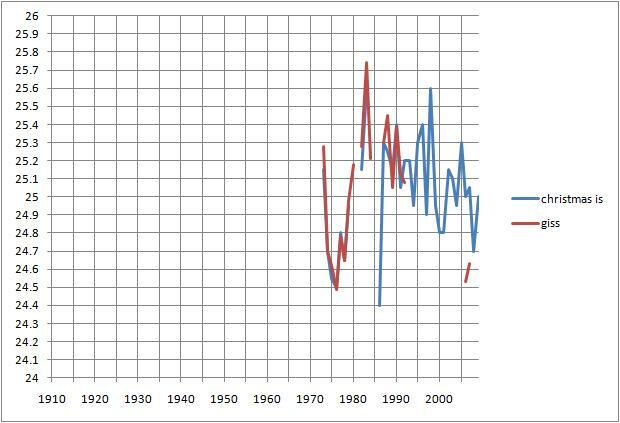 Some of this is no doubt due to infill of missing data. Let me know what you would like to share. 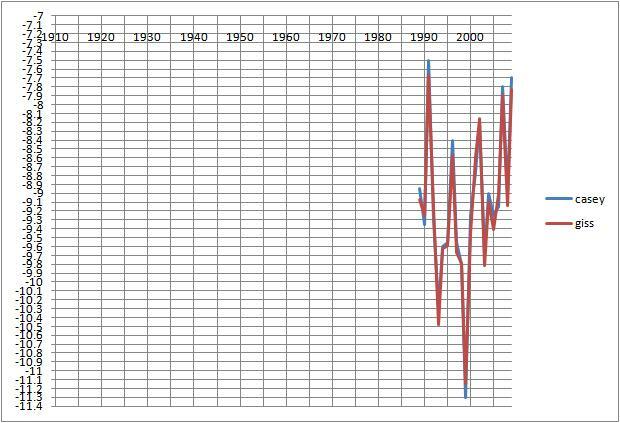 I’m interested in a previos observation that some inland BOM stations 1968-2008 show a greater T increase than some coastal stations. Later, I’ll be looking at your Giss figures to see if they overcome this problem. The record Deember rainfall at Buderim was 609.4 mm set in 1926. This December we already have had 617.1mm. I live about 200m from a closed weather station (040032). This operated in parallel from 1945 to 1981 with 040031 (about 1.5km away) which open in 1893 and closed 1995. I did statistics on the monthly values over the overlap period. The differences of averages for each month and the standard dev. of the difference of each month of the overlap were only a few mm so by the “t” and “F” test one can say they came from the same population. One can see cycles in the rain pattern. 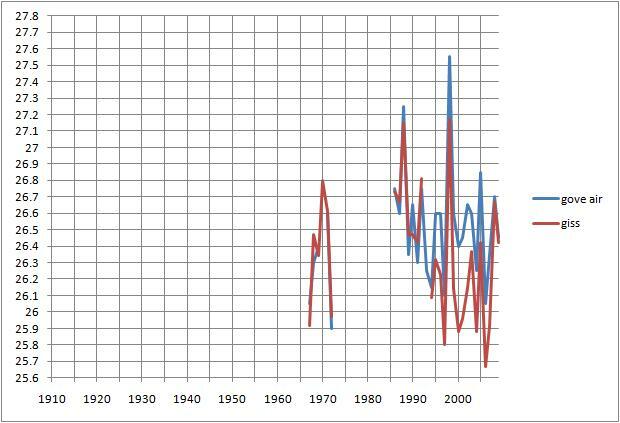 At other times BOM have linked rain to SOI which has its cycles. 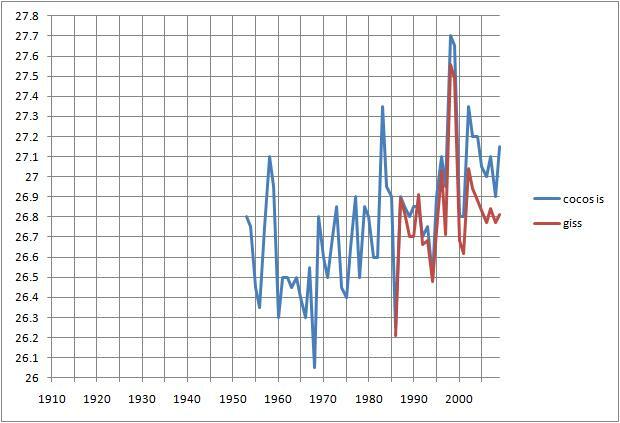 The recent drought (below average rainfall) lasted from 2000 to 2008 which is considerably shorter than the Federation drought from 1899 to 1915 (every year below average with the lowest on year on record at 388.3mm in 1902- the highest on record was 1898 at 3996.9mm). BOM appear not to be looking at their own records. Further, compounding the forcast situation is the dropping of longterm stations. Landsborough PO (04117) which has been operating since 1892 was closed in October this year 2010. Sunshine Coast Airport (04861 open in 1994) which is right at the coast is one of the few left in this area. And Happy New Year to you too Peter! Coldest December day records in many places too. Keep reading this page late January for more info. I’m in holiday mode for the next couple of weeks so I will look at Trewin’s paper and the effects of this algorithm change when I can. 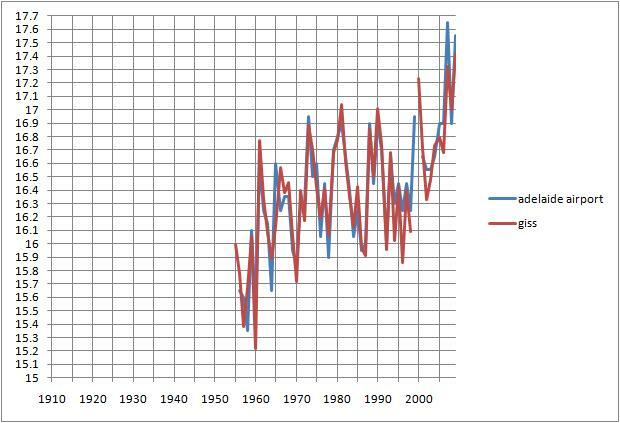 My first reaction is that it caused a remarkable difference, and only in the past couple of years have BOM and GISS data converged. You have brought me a Christmas present. I read Trewin a while back but the significance of your observation did not pop out at me with my then state of understanding. Maybe some of the puzzles of my post at December 9, 2010 at 12:16 pm above have answers in your response. Further to the 1990s transition from mercury-in-glass to electronic sensors with increased reading frequency each day, I was wondering about this two years ago. With help from David Stockwell, I composed a short (and inconclusive) essay. It seems that the BOM are in a bit of a bind. When you change a fundamental measurement method, you tend to do so because you expect a better result. That can also be a DIFFERENT result. I’m not a Luddite, when it is time to change to better gear, you do it. However, as events have panned out, the BOM has chosen not to be terribly open about changes. One can look up rudimentary meta data sheets for many weather stations to find dates of method changes, but there is no concise official description that I can find to look at the magnite or treatment of the change. 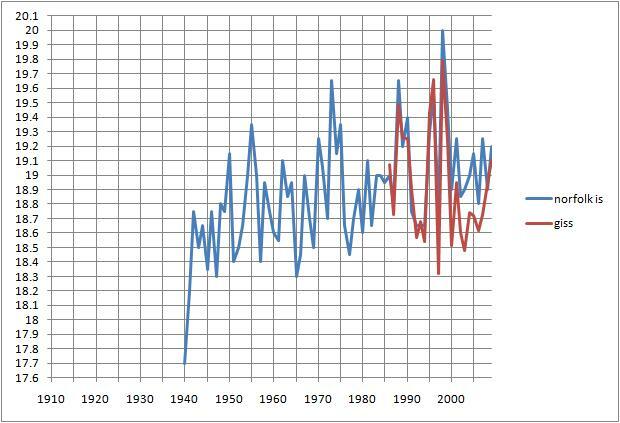 The BOM had two broad choices: to make the change in one step, or to taper it out over a number of years. The latter approach looks more likely from the data available to me and the essay above, though it is not 100% diagnostic. 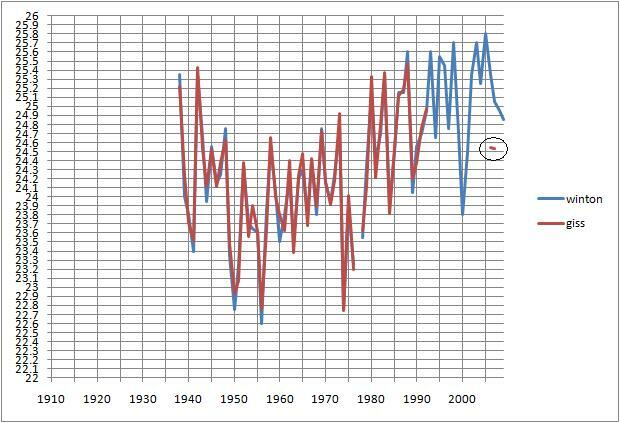 If the new equipment was overall reading lower than the decades before, then a tapered adjustment could be made in two ways, one being by lowering the temperature record preceding the change and the other by raising the temperature after the change. However, sooner or later the reports would have to match the actual record for the day, or the taper adjustment would distort the record too much. Strangely, there is some evidence that the BOM are taking another approach, by having a public record and a private record that is different. Australian taxpayers can buy one version for a fairly hefty sum, while the other seems to be going to NOAA in USA free of charge and further responsibility, for overseas adjusters to work further magic. 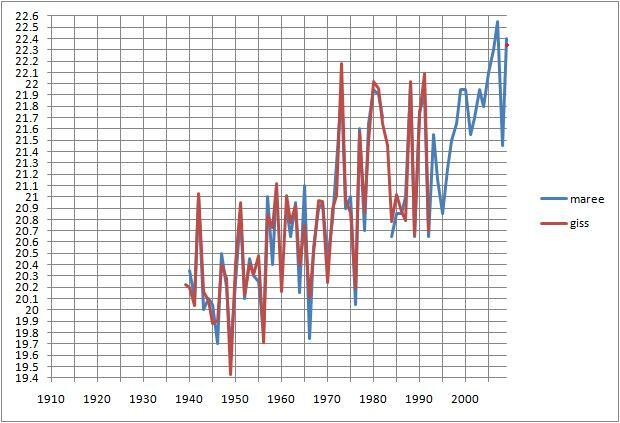 Which leads one to wonder if the statement made on 5 Jan 2011 by Dr David Jones – that the decade just ended was Australia’s warmest since 1900 – is correct in an absolute sense, or an adjusted sense, or both. Remember that many early records about 20 years each side of 1900 were also adjusted cooler because of the presumed absence of Stevenson screens (even though documentation is sparse). Scientic courtesy might indicate that an explanation was in order, given the announced change in methodology. 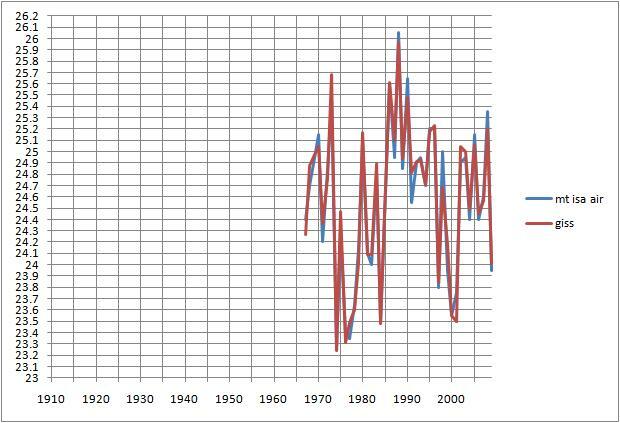 There is still a plausible case that there has been no overall Australian temperature change in the last 110 years, within the limits of error and method change. Yep, knew that, good comparative data period. A splice I’ve recently made pretty much matches BOM’s reconstruction. The charts below are sourced to data from the GISTEMP recordings by the Goddard Institute of Space Studies and the Australian Bureau of Meteorology High Quality database. 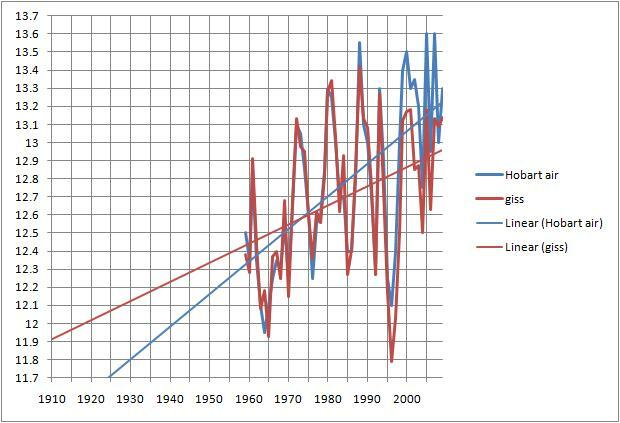 The GISS data is sourced from raw GHCN data with USHCN corrections. 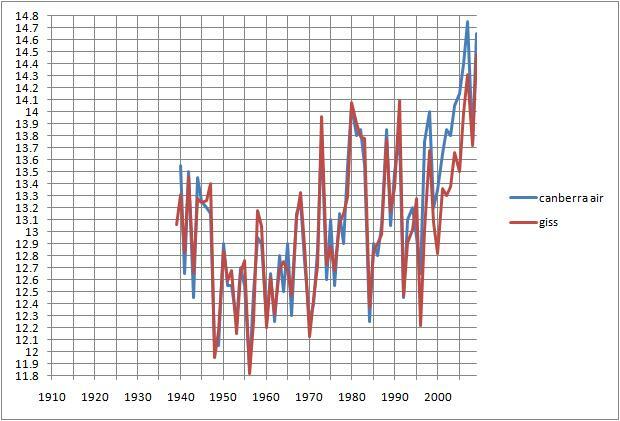 The original source is raw temperature data from the Australian Bureau of Meteorology. Temperatures in the BoM HQ database are adjusted by the bureau. 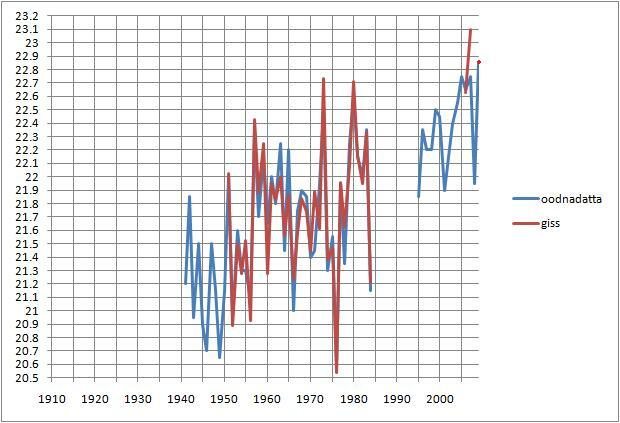 Note that in most but not all charts the BoM HQ temperatures trend above the GISS data as of 1993, and temperatures in many of the locations are the same or similar in 2008 and 2009. 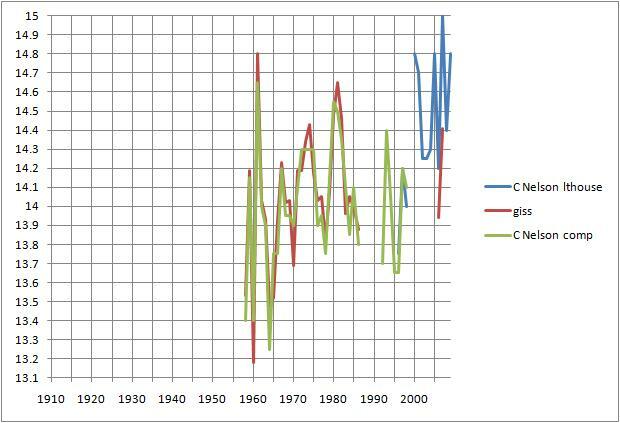 Various locations in the GISS database, particularly those with long records preceding 1940, have missing data beginning in 1993. 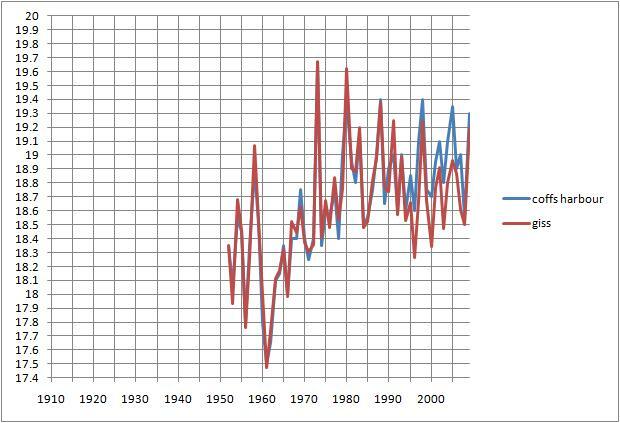 Why do temperatures in the BoM HQ data, upon which Australia’s historic warming trends are based, consistently rise above the actual raw temperatures in the GISS database, usually from 1993 to 2008?